Mostly the students have to wait for the completion of Graduation to place in any of the prestigious company, but HCL Technologies Ltd, India’s fourth-largest software service exporter, is giving captivating opportunities to Class 12 students. 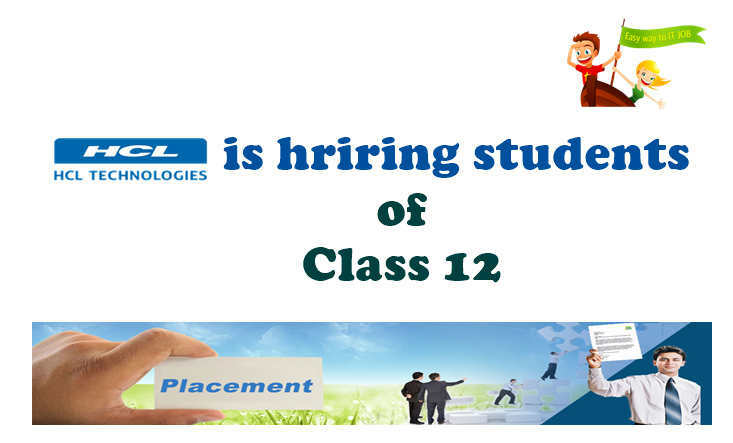 The company is offering placements directly to the Class 12 students straight out of school. Unlike other companies who offer college placement, HCL will hire the students straight out of schools and train them to be IT professionals and those trained professionals will work for the company. HCL will hire students directly after Class 12 - Highlights of the news! According to the reports, the HCL Technologies will give training to 200 students from Class 12 for a year. The training will begin from April, and the candidates will be given entry-level software jobs. To apply for the job, the candidates need to score minimum 85 percent in their Class 12 board exams whereas the candidates who are appearing in board exams from CBSE Board need to score minimum 80 percent. The students after the successful completion of the programme will be offered Rs. 1 Lakh and 80 thousand of yearly salary. All the students will also get the opportunity to complete Bachelor of Science degree from an engineering college through a weekend college programme. In early months, the students will learn the combination of the basic engineering which comprises of the application development, software testing, application support and infrastructure management services. ''The programme aims to provide opportunities to bright students who do not have access to the right jobs. This will also help the company to create a dedicated workforce. We are looking at onboarding young minds," Srimathi Shivashankar, Vice-President, HCL Technologies told BS. For any queries related to this news, you can write to us in the comments section below.